Air and Water Power kit - Physics | Assessment Services, Inc.
Pneumatic-Hydraulic Engines. Build you own models powered by air and water pressure to learn about the laws of physics. Construct 15 different hands-on models. Includes a 48-page instruction book. Ages: 8+. Build your own models powered by air and water pressure to learn about the laws of physics. 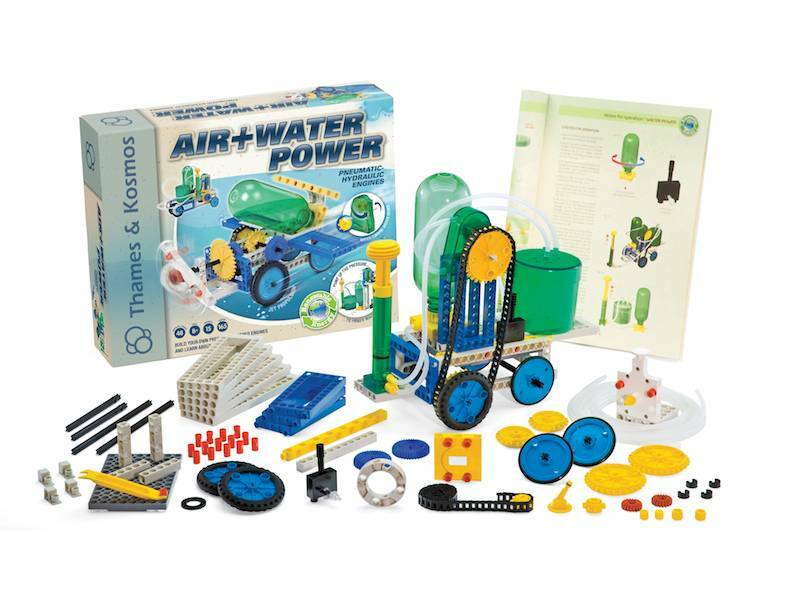 This unique kit allows you to build two different air-and-water-powered systems: water-jet propelled cars and hydro-pneumo (which simply means air pressure and water pressure) powered engines. The hydro-pneumo system uses a self-contained air-and-water turbine system as a motor. Construct 15 models including a truck, excavator, radar car, tank, antique car, helicopter, motorbike, backhoe, rocket car, forklift, roadster, propeller plane, grinder, and cutting machine. The water-jet propelled cars are a fun outdoor activity, while the self-contained hydro-pneumo powered models are fun both indoors and out. Compete with your friends to see whose water-jet propelled car and hydro-pneumo car goes the farthest! 48-page color instruction book. 165 building pieces.